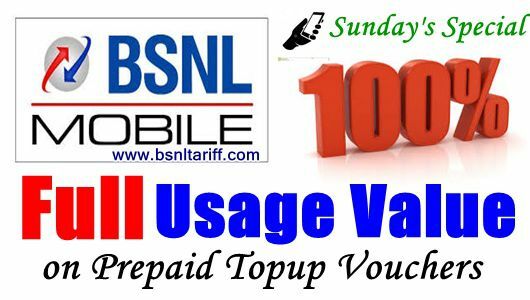 BSNL Mobile to encourage its valuable Prepaid customers in holidays i.e on regular Sunday’s (Upcoming three Sunday's) announced Full Usage Value on GSM Topup Vouchers. State runs Telecom Company Bharat Sanchar Nigam Limited (BSNL) has announced Full Usage Value offer equal to MRP on the Topup of Rs.220/- in Tamilnadu Telecom Circle (Including Chennai Telephone District) under GSM Prepaid plans mobile services. The latest information from BSNL sources, Tamilnadu Telecom Circle Competent Authority announced Full Usage Value especially on upcoming ‘Sunday’s’ for Prepaid plans users on Topup Voucher denomination of Rs.200/- on 15-11-2015, 22-11-2015 and 29-11-2015 (3 Sunday’s). This offer is applicable for both 2G Prepaid / 3G Prepaid customers of Tamilnadu Telecom Circle as Promotional Offer basis in November, 2015. The above Sunday’s special offer will be implemented with effect on 15th, 22nd and 29th of November, 2015.